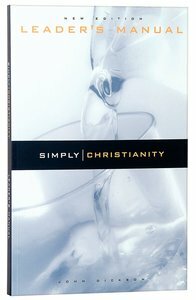 This new edition of Simply Christianity makes a great evangelistic course even easier to use. Simply Christianity has been highly successful in introducing small groups of enquirers to Jesus through reading Luke's Gospel and discussing it with a Christian group leader. It is a 'lounge' course, designed to be done in a friendly environment where people can build relationships as they discuss the gospel in depth over five sessions. Written by John Dickson, this new edition incorporates the complete text of Luke's Gospel into the Guest and Leader's Manuals. It has been thoroughly revised, with extra material on God's judgement, how Jesus fulfils Old Testament prophecies and further evidence for the resurrection. The Leader's Manual provides extensive guidelines on how to run each session, how to use the extra information, and how to tell your testimony to a small group. An excellent way of communicating the gospel of Jesus to both young and old. About "Simply Christianity (Leader's Guide)"
The Leader's Manual for an evangelistic course to introduce people to the Good News of Jesus Christ. John was the Founding Director of the Centre for Public Christianity and now is a Senior Consultant to CPX. He has a degree in theology and a PhD in ancient history. An ordained Anglican minister, he was a Research Fellow of the Department of Ancient History at Macquarie University (2005-17), a Visiting Academic in the Faculty of Classics at the University of Oxford (2017-18), and teaches a course on the Historical Jesus for the Department of Jewish Studies at the University of Sydney. He has hosted two nationally televised documentaries and authored more than a dozen books.